Patra's Other Place: Happy chappy! Phones are back and Ken is happy. We made up. But still not happy Jan! 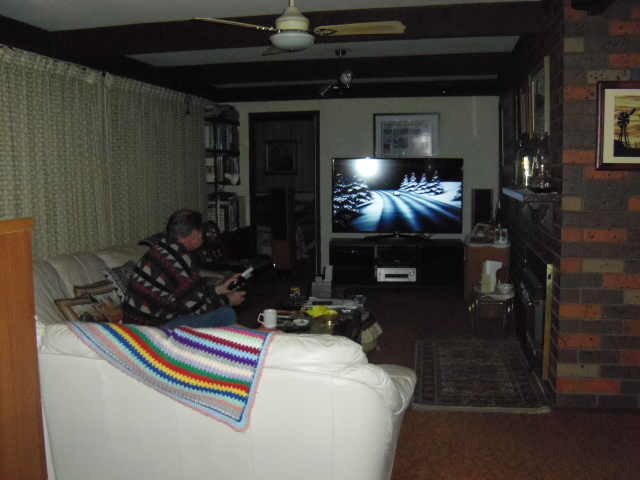 Here is Ken watching his new Toy/TV. It looks so much better than the old one because it is closer to the wall, and being a flat screen it doesn't stick out into the room as much. And the extra equipment is much neater in the cabinet underneath the screen, rather than in the vertical cabinet we had before. I don't know what it is about men and equipment to watch moving pictures but yours seems much the same as mine in that way. Good that he's happy!